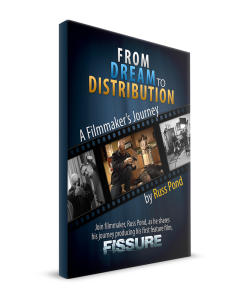 I’m excited to announce the release of my new eBook, From Dream to Distribution: A Filmmaker’s Journey! In early 2006, I decided to chase my dream to make a full-length, feature film. It started with just an idea fueled with some passion (and hazelnut lattes). I wanted to capture all aspects of this process like scripting, planning, financing, legal documents, casting, crewing up, distribution and the web. One of the key topics I focus on throughout the book is how to position your film for successful distribution, and what steps you can take to get your film sold. At the conclusion of the book, I breakdown a list of the things I did right, but also the things I did wrong. And, what I will do for future productions to avoid the previous mistakes. I also include an update to our latest film, Infiltrators. Join producer and director, Russ Pond, as he chronicles his filmmaking journey while making his first feature film, FISSURE. Learn about the many aspects of developing, producing and distributing a film in today’s entertainment landscape, including traditional paths for distribution like DVD, theatrical, television, VoD and streaming, as well as, new web-based opportunities for marketing and online distribution. As part of the purchase of this eBook, I’m also including a free online viewing of the movie, Fissure. Details are in the book.